Originating in the Old West when cowboys needed to treat or brand steers too large or difficult for one man to handle alone, ranchers would often use teamwork with friends and horses to catch the livestock. This is a common practice many ranchers still use today. Team Roping is a true team event requiring coordination and timing between two cowboys, the “header” and the “heeler.” Both contestants start from the boxes on each side of a chute located on the side of the arena. Similar to Tie-Down Roping, the steer is given a headstart. 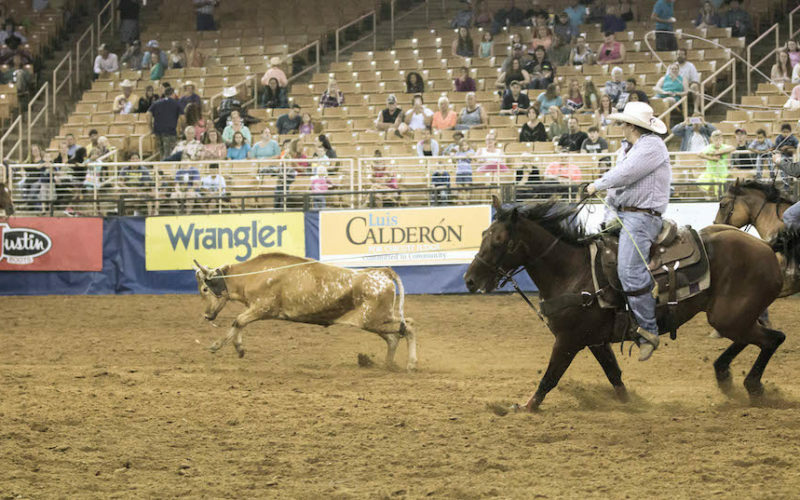 With one end of a breakaway barrier attached to the steer, as the steer runs into the arena, the barrier is stretched across the open end of the header’s box while the header (the first roper) waits behind a barrier. Once the chase begins, the header will aim for and must successfully lasso the steer either around both horns, around one horn and the head, or around the neck. Any other catch by the header is considered illegal, and the team is disqualified. However, if the header chases after the steer without giving it a proper head start, otherwise known as “breaking the barrier,” the team receives a 10-second penalty added to their run. After the header makes a successful catch, he then “dallies,” or ties the rope to the saddle and tows the steer behind him. This move not only ensures that the rope doesn’t slip out of his hand, but also helps him and his horse control where the steer runs. This makes it easier for the header to turn the steer, so its hind legs are turned toward the heeler, making it easier for them to rope the steer. As the heeler runs toward the steer, they must wait for the perfect opportunity to rope both of the steer’s hind legs. If he catches only one foot, the team will be given a five-second penalty. The timer is stopped when the steer is roped by both contestants while their horses face the steer with both ropes dallied and the rope tight. After the header ropes the head of the steer, he'll often turn the steer's rear toward the heeler so they can rope the steer's hind legs more easily.